I haven't shared any of my favorite meals on this blog in quite a long time! I really enjoy cooking and experimenting with meals. I'm so busy during the week that I often reuse past grocery lists and reuse the food from that list in a different way so I don't get bored. This salad was a result of one of those lists and the result of my love of fingerling potatoes. It's a salad that's simple, healthy and hearty. Chop up lettuce and tomatoes (I use my favorite - yellow heirloom tomatoes). Put all the veggies in a bowl and toss with a little olive oil, salt, pepper, and cider vinegar. Add dried cranberries and goat cheese. Sometimes I like to add nuts. 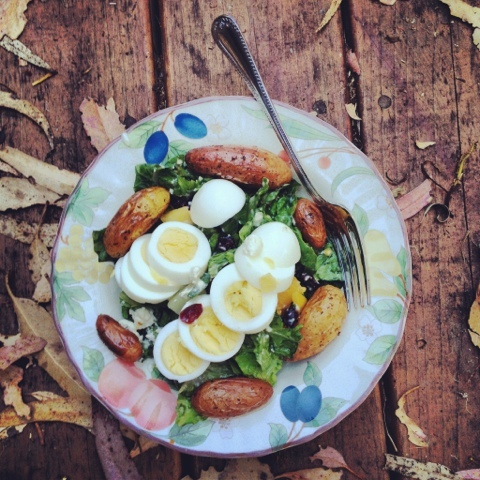 Slice hard boiled eggs to add on top of salad, and don't forget to add the fingerlings! !